A radar image shows the crater of Eyjafjallajokull in southeast Iceland which has caused the cloud of volcanic ash to spread over Europe. Looks like a screaming demon, no? X-wars are being fought that make it look like nature or God is doing it. The masses of people believe they are in relative peace, not realizing that the earthquake that killed thousands was not accidental. State-of-the-art military technology uses the earth itself as a weapon. World War Three has probably started and we don’t even know it. Chemtrail spraying appears to compromise our immune systems. It may be lowering our resistance to both disease and to the removal of our basic rights. Aerosols are also being sprayed to seed the atmosphere with barium. The HAARP Patent calls for spraying barium in the atmosphere to increase HAARP’s efficacy. HAARP is capable of more than you are likely to believe. HAARP quadrupled its power and published plans call for operating HAARP at one billion watts. HAARP can cause massive blackouts. Its inventor Bernard Eastlund seeks to abort tornadoes and to "steer' parts of the ionosphere around with it, among other things. "Special secret mode of conducting wars. This concept was developed, when it became clear that direct military conflict will inevitably result in nuclear self-destruction. Then the idea appeared that the battle can be conducted while pretending that the conditions of peace are being maintained. In fact, the war is going on, but by the other, "quiet" means. They include the methods of economic and financial diversions, information-psychological technologies aimed at degrading the social structure of the attacked people. Biological diversions infected cattle or agricultural plants or even people, not by some disease causing death, but by an infection planting panic and confusion within the society. Certainly, technical devices causing accidents not only to planes, but to power systems might be created. 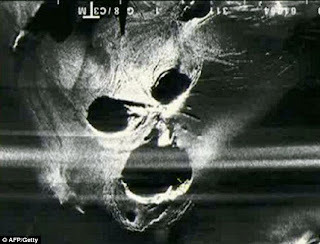 During the period of "Cold War" much money was invested into the development of the X-war methods and technologies." The idea that powerful people wielding powerful technologies can make natural disaster look like Acts of God does not preclude God from actually performing his own acts. Check out the results of this volcano. X-wars or bona fide Act of God. You decide. The National Air Traffic Service (NATs) has advised this afternoon that British airspace over England and Wales will remain closed until 7am tomorrow. But it is likely the time will be extended as Iceland volcano Eyjafjallajökull shows no sign of subsiding. Transport Secretary Lord Adonis said travellers could expect 'significant disruption' to services for at least the next 48 hours. ...The Met Office has only issued weather predictions until 1am tomorrow, but these show the ash cloud — at 30,000 feet, the altitude used by commercial airliners — widening its grip over the southern half of England. With the source of the ash - a volcano 700 miles away in Iceland - still spewing smoke into the atmosphere, there are already fears the chaos could go on for days if not weeks. Some experts said there could be disruption for six months as a result of contaminated air drifting over northern Europe. ...No jet planes can fly except in an emergency because the dust causes their engines to fail. Health officials have told those with conditions such as asthma to stay indoors. The cancellations have already caused the greatest mayhem to air travel since the Second World War. ...The ash, which will drift down from the north of the country, was predicted to appear as a dusty haze and may smell of sulphur or rotten eggs, or strongly acidic. 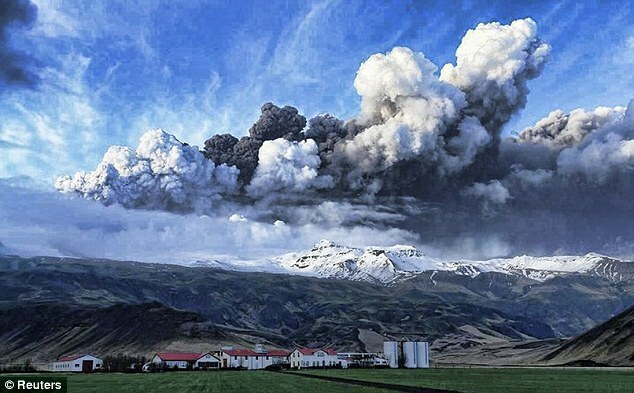 ...Reports from Iceland said the eruption spewing ash into the atmosphere from Mount Eyjafjallokull showed no sign of abating after almost two days of activity. ...Even if the current eruption subsides within days, it may not be the end of the travel chaos that the volcano can cause. 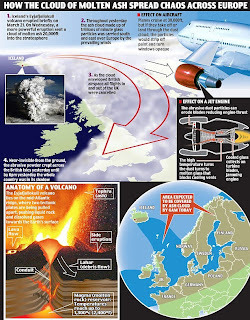 It last erupted in the 19th century and Bill McGuire, professor at the Aon Benfield UCL Hazard Research Centre, based at University College London, said if the volcano continued erupting for more than 12 months, as it did the last time, periodic disruptions to air traffic could continue. Even without further groundings, the knock-on effect of the initial disruption will take days to clear with planes, passengers and crew all in the wrong place. In a blanket move - worse even than in the aftermath of the 9/11 terror atrocity - air traffic controllers were forced to completely close British airspace at midday yesterday as the volcano pumped massive clouds of ash thousands of feet into the air. The huge dust cloud, unseen from the ground, slowly drifted across northern Europe at the height that jets cruise across the skies. ...Nobody was able to beat the flying ban. Those caught up included the Duchess of Cornwall, who had been due to fly from Aberdeen to London, and LibDem Treasury spokesman Vince Cable, who had to cancel election campaigning in Scotland. The eruption has not caused any deaths. Just some evacuations, flooding, etc. So, not deadly. (source) The eruption has also caused European Parliament President Jerzy Buzek to cancel a meeting with Pope Benedict XVI at the Vatican. A meeting of EU finance ministers planned for Madrid on Friday-Saturday might also have to be cancelled. (source) Also, some people might not make the Kaczynski funeral at Wawel Castle. There was one upside, however, with weather experts predicting that the particles in the atmosphere could cause some spectacular sunsets over the coming days. UPDATE: Looks like no decent hope goes unwhacked these days...Evidently, only *civilian* aircraft seem to be in any danger from the ash. NATO airplanes? No worries. It's just more kabuki, peeps. aangirfan: ASH NOT AFFECTING NATO? "Some wonder whether there is something else going on under the cover of earthquake eruptions, such as a test run to shut down air travel internationally." "In just one day, volcanic ash spewing forth from Iceland’s Eyjafjallajokull has brought airports to a halt in the United Kingdom, Ireland, France, Belgium, The Netherlands, Switzerland, Norway, Denmark, Sweden and Finland and is expected to spread over other areas of Europe by Thursday evening. The last time this volcano blew, it was deadly, emitting large quantities of toxic fluoride gas. The last time Eyjafjallajokull had an episode was in 1821, pouring tonnes of ash containing toxic fluoride gas into the atmosphere. It lasted not 24 hours, but until 1823, causing the deaths of many cattle and sheep through fluor poisoning. 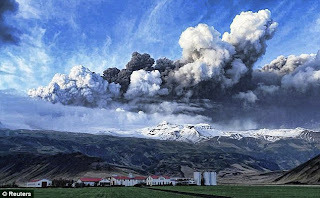 Eyjafjallajokull has had four eruptions in the last thousand years: in 920, 1612, 1821-1823 and now in 2010. All of the previous eruptions were precursors to more massive activity from the neighbouring Katla volcano but as yet geologists have not registered any seismic activity." i hope that doesn't happen. so far i've seen nothing to indicate any deaths from it. Peasant I was tempted to go Nostradamus on you but decided to spare you. Question is would the EU use Haarp on themselves and coat themselves in fluoride gas? There are said to be other parties who have this technology. Just a thought. my point with this post is that they think they have it all sewed up, but they can't control everything. i detect (i hope) a sense of humor and impeccable timing in this iceland volcano, which although extremely disruptive is not destructive except for wrecking plans for rituals and deals. boo hoo hoo. we know how important their dates are to them, to their magick. thanks for that link dubs, lots of good stuff there. “"Eyjafjallajokull has blown three times in the past thousand years," Dr McGarvie told The Times, "in 920AD, in 1612 and between 1821 and 1823. Each time it set off Katla." The likelihood of Katla blowing could become clear "in a few weeks or a few months", he said. ha, i don't know chuck. i still see this one as wrecking their plans. so i see it as a positive, as far as i can tell so far. Indeed A.P That’s an angle I had not gotten around to yet. I was musing recently about watching the sunset recently and tonight was a stunner. I may be a gloom monger from time to time but I also sometimes like to stop and admire the scenery. well that certainly seems hopeful huh? hahaha! Chucky they called me a shica the other day on the dog's site. I assume I am a shiksa!!! a shiksa? you better get the lingeri from chuck. but please, no photos. personally i do see you more as a hooligan dubs. My posts used to show up here immediately. It takes quite a while sometimes now. They dance in cyber space somewhere and then show up. May be time to change computers. i don't know what is causing the time delay dubs. no idea. sorry. I have had the same phenomenon over at Greg’s place. It could be a simple delay/ busy server or they could be dicking with us. Considering we aren’t paying for this we really can’t complain. oh well you should know what a shiksa is! it's a goyim woman. The word shiksa is etymologically partly derived from the Hebrew term sheketz, which means "abomination", "impure," or "object of loathing", depending on the translator. Despite its etymology, the term shiksa is widely used and accepted in the United States, where it is often used in a humorous way. The word (written "siksa", pronounced "shiksa") in Polish Gentile culture is a popular pejorative (but often teasing or affectionate) word for an immature young girl or teenager. It means "pisspants" and is roughly equivalent to the English terms "snot-nosed brat", "young squirt", "young breasts" or "young goat" ("kid"). It is a conflation between the Hebrew term and usage of the Polish word "sikać" ("to urinate"). I just read the Laki volcano blew in 1782 and the toxic cloud killed tens of thousands across Europe. The bad part is a predisposition for it to go after this recent one. maybe we can make a human sacrifice to the volcano to appease it? i'm thinking a planeload of satanists? oh haha, just kidding. seriously i hope the thing doesn't blow. do you get the alta reports? aren't they talking about volcanoes going this year all over the place? did you already tell me this? I read that one. I guess we will know more in July. Iceland is in a very precarious position. It reminds me of when I used live in Yuma.